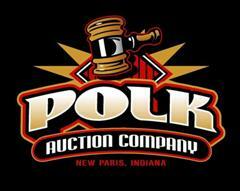 Because the owner of Polk Auction Company, Jeff Polk, is a practicing auctioneer, the owner of a large auction company, along with years of experience of buying and selling farm and industrial equipment, he is uniquely qualified to provide an appraisal of the current market value of your equipment. During the appraisal process, each piece of equipment is individually evaluated as to condition, which is the primary driver of the final value. Then each piece of equipment is appraised based on that assessment of condition. Each unit is detailed in writing with a description of the condition and an appraised value for the unit. Appraisals are sometimes needed for a specific point in time and, although certainly more subjective than a current appraisal, we have the capability to do that based on the current value and our knowledge of the changing economic conditions and the geographical area involved. it is a single unit or a multi-unit collection. Toll Free at (877) 915-4440.